Please come welcome the Year of the Rabbit at Arlington Center for the Arts on Saturday, February 12th. I will perform “Monkey Wreaks Havoc in Heaven”, an episode of the Chinese epic Journey to the West. The magical monkey flies to the Heavens and takes a job in the Jade Emperor’s peach garden. But when the monkey is snubbed by other gods and goddesses, he sneaks into a banquet hall and eats the preparation for the New Year’s celebration. And that’s just the beginning of the trouble. The show starts at 2 pm at the ACA theater, 41 Foster Street, in Arlington. (directions:http://acarts.org/directions.php). Tickets are $5. 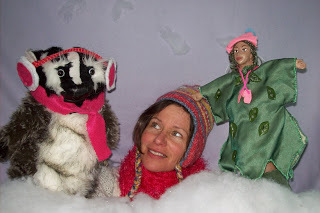 Please come for the show and stay for coffee and puppet play afterwards. We can save up to 20 tickets in advance. If you would like to have tickets saved for you, please e-mail galapagospuppets@gmail.com before Friday, February 11th. We’ll save the tickets until 2:45 on the day of the show. I worked on “The Trolls and the Tree” in the hottest part of this summer. The show opened August 13th at the West End Branch Library in Boston. For three weeks before that, I kept the stage up in my living room because my upstairs studio was too hot. I got more work done, too, because the stage was always right there, begging for attention. 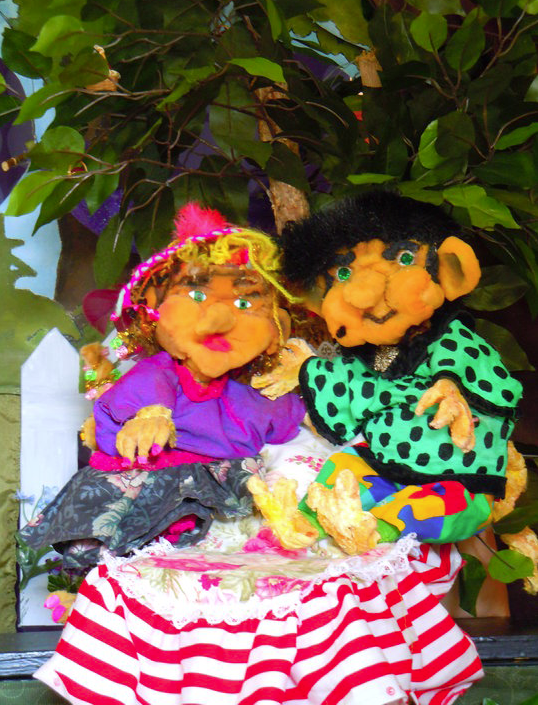 In “The Trolls and the Tree”, trolls Skimpa and Blompa garden-sit for woodland fairies for a week. They move their TV in and watch a shopping show. Will Adams-Keane, a college student of many talents, filmed a nice little shopping episode, edited it, and added music. See the result on this page. Audiences and the trolls see the video through a digital photo frame, mounted on the stage. For the first show, Will and I pieced together bird and car sound effects and terrific fairy music from Alison Plante. Then, in September, Alison and I had time to work on a more complete sound track. Now the show has original, evocative music from Alison, a video segment, and a toaster that makes troll toast. 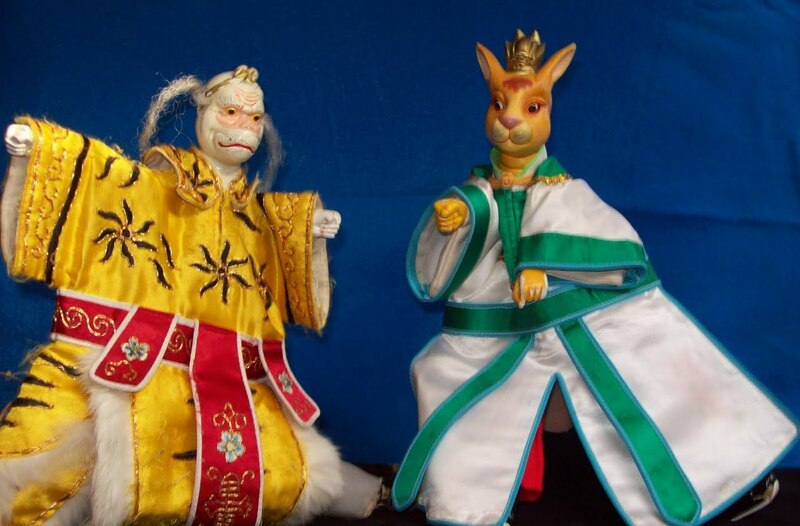 Puppetry events in Boston this fall include the “Incubator” at the Puppet Showplace in Brookline. Every other Tuesday puppeteers meet to advise and inspire each other. 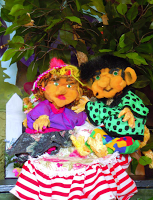 Schedule: puppetshowplace.org. After a busy fall and winter, I have studio time again. It seems like every puppet needs fixing! This cat is getting improved eyes and whiskers. And slowly, I am working on a show called “The Trolls and the Tree.” In it, Swedish trolls Blompa and Skimpa agree to take care of the fairies’ garden while the fairies are away. But they don’t take care of it. They bring in their satellite dish, and pull up a tree that they think takes up too much space. Without the tree, there are no birds, and it’s really hot in the garden. Can the trolls bring the tree back? What will the fairies do? Can trolls go green? Madeleine, who represents Galapagos Puppets in New Jersey, has just performed “Esther’s Story”, made from diaries her aunt kept in Germany during the Holocaust. And now she is in the middle of finals in graduate school. Welcome spring with a trip to the fairies’ blooming garden. 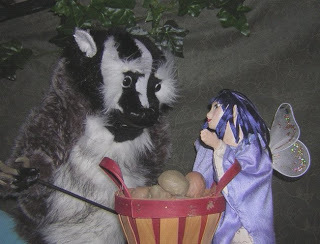 Margaret will perform “Badger Meets the Fairies” on March 21st at 2 pm, Arlington Center for the Arts, 41 Foster Street, Arlington MA. Tickets are $5. 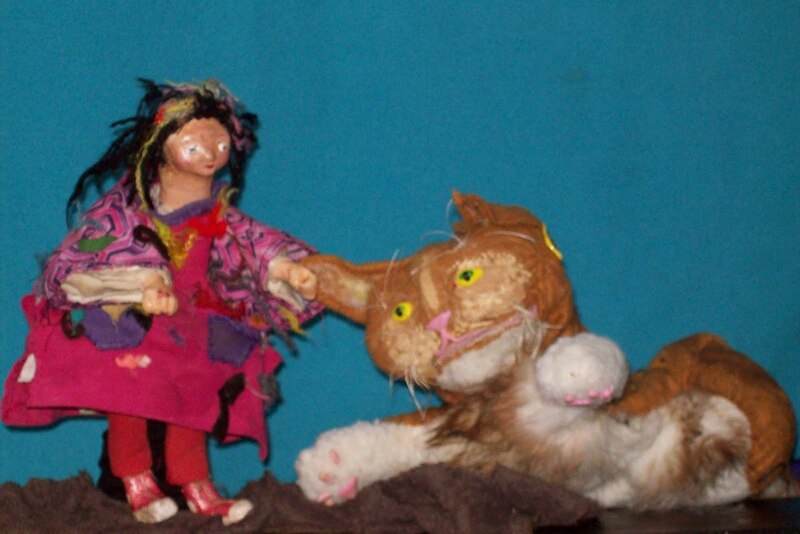 Please stay for puppet-play and coffee after the show.